Earnings season is upon us. And earnings growth is showing signs of slowing down. Last quarter, earnings were much better than expected. Analysts expected earnings growth of 17.1% for the companies in the S&P 500 Index. Those companies delivered growth of 24.8%. That high level of growth is a potential sign of an earnings peak. An earnings peak occurs when growth tops out and begins declining. That’s a normal part of the business cycle. Earnings growth rises and falls as the economy grows and contracts. The business cycle and a slowing economy are also the causes of bear markets. And with an earnings peak in the rearview mirror, it’s time for investors to be concerned. In the long run, earnings simply can’t grow at 25% a quarter as they did last quarter. The long-term average growth rate is less than 4%. Actual earnings in any quarter can be above or below average. But in the long run, the data moves toward the average. The move back toward average begins this quarter, according to analysts’ expectations. 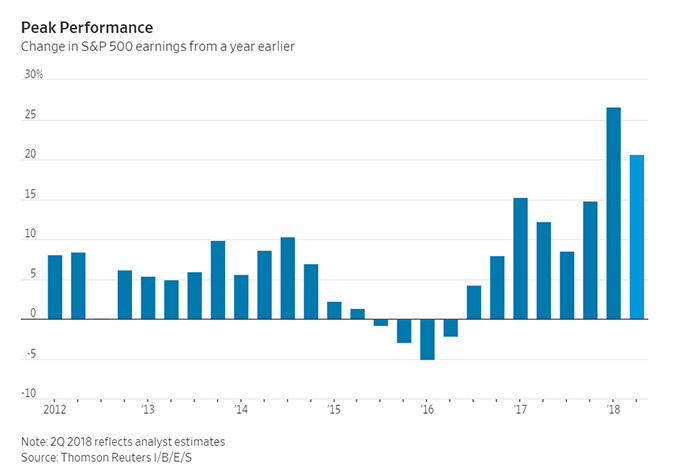 Earnings growth for the companies in the S&P 500 is expected to be about 20% compared to a year ago. But actual earnings are likely to be higher than that because analysts typically expect too little growth. On average, their estimates are 3.8% too low. This quarter, earnings are likely to show growth of about 22%. That’s more than five times the average. And this will be the third straight quarter of double-digit earnings growth. This is probably as good as it gets, and earnings are bound to drop back toward their long-term average. In 2019, earnings could be below this year’s level since so much of the growth came from one-time gains associated with tax reform. As earnings growth drops back toward the average, gains in the S&P 500 tend to decline. Ned Davis Research, a well-respected research group, studied the stock market’s performance after rapid earnings growth. It found when earnings growth tops 14.2%, the S&P 500 delivers below-average returns. When earnings grow this fast, the S&P 500 declines an average of 2.9% over the next year. The best returns in the index come when earnings growth is below 3.4%. A year from now, the S&P 500 will likely be lower than it is today. But it could move up sharply before weakness sets in. Now is a time for caution, but not for fear.